If you're celebrating Thanksgiving Today - Happy Thanksgiving. If you're not - Happy Thursday, Friday is right around the corner! 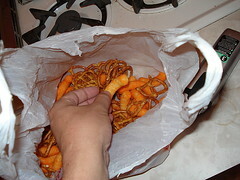 So I ask you, what's worse, eating Cheetos out of a Walgreens bag because they were leftover from the party or just eating the Cheetos and leaving the pretzels behind?